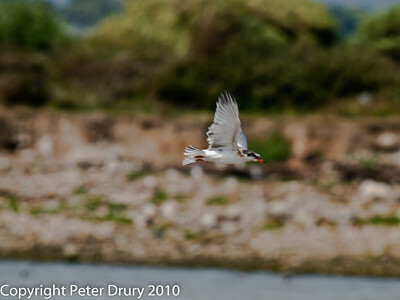 The Oysterbeds Wildlife Site - Common Tern. 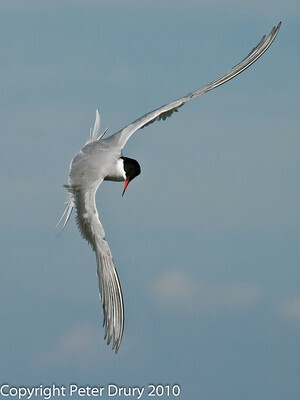 Common Tern, on migration from Africa, start to arrive in May. 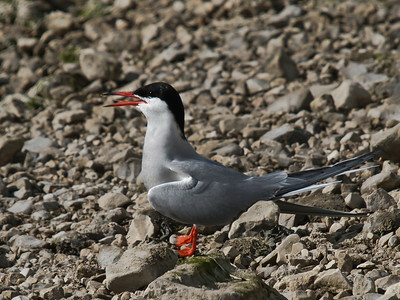 They will seek suitable nesting sites in the harbour preferring the sites where they were successful in the previous season. 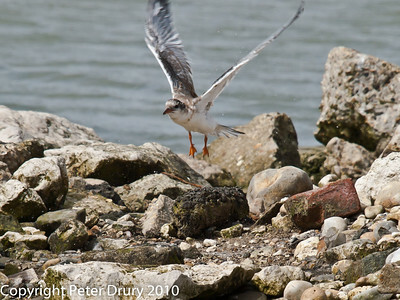 Considerable work was carried out before the 2010 season to remove plant growth and re-profile the lagoon islands with fresh shingle. 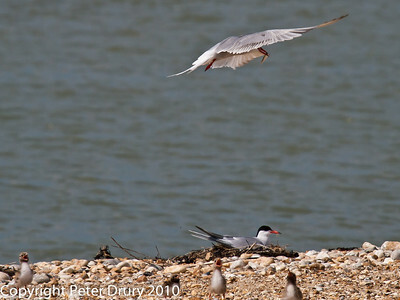 This work has increased the surface area on top of the islands and reduced the risk of sites being chosen near the water's edge which could be flooded during a combination of high tides and stormy weather. 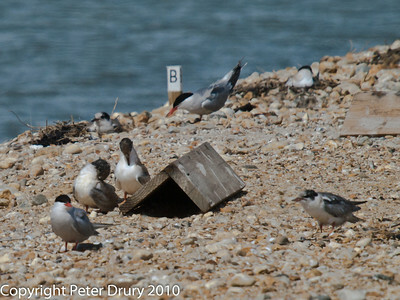 In addition, bright coloured tape was strung over the islands to discourage early nesting of the Black-headed gulls. 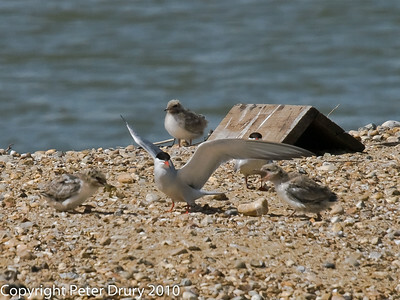 17th May 2010 and the tern begin to arrive at the Oysterbed site. 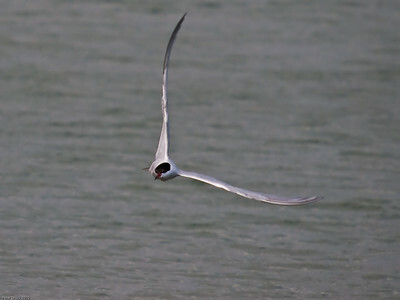 Their fast and graceful flight once more bringing a pleasing sight to the lagoon. 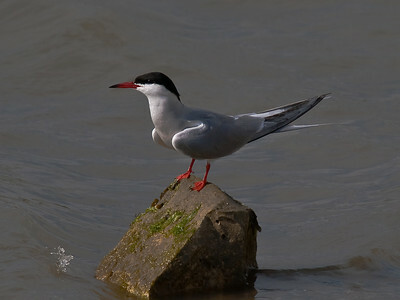 Tern do not build nests but create scrapes in the shingle. 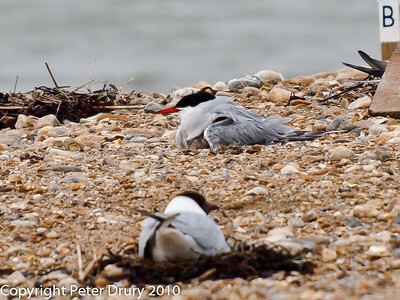 Two Tern females are resting in their scrapes with the males alongside. 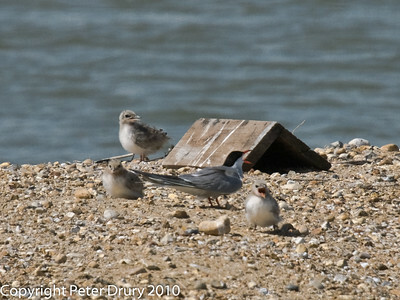 In the background can be seen their Black-headed Gull neighbors. 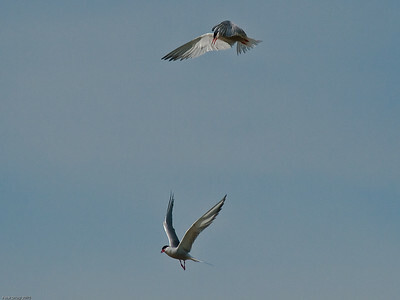 No-longer can the Black-headed Gulls consider the islands as their own. 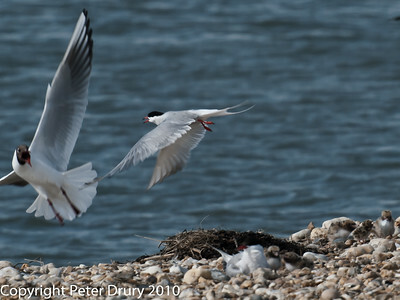 Here, a Common Tern is challenging a pair of Gulls for part of the nesting site. 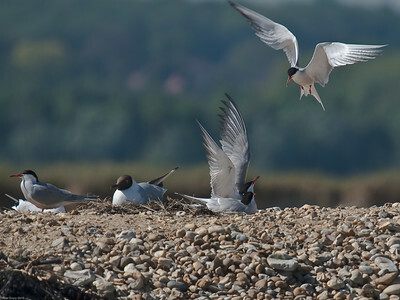 Now the lengthy period of partner selection, egg laying and incubation begins. During this period, the sitting partner has to be fed. 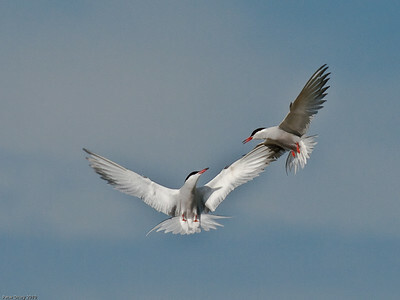 Here one bird has raised its wings to greet its partner. 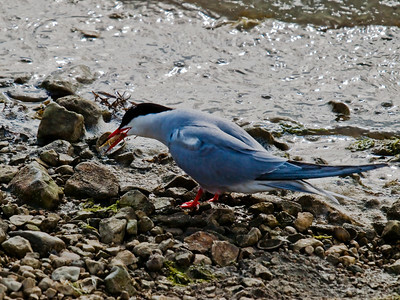 The Tern do not have to go too far to find food. The lagoon is full of small fish and crabs. 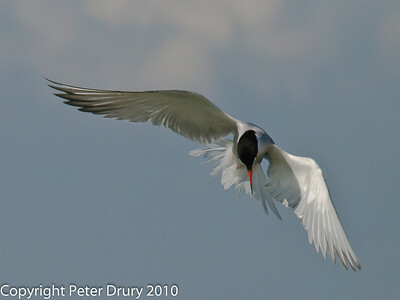 This 'hunting' pose is quite common, hovering with head down, looking for potential prey. 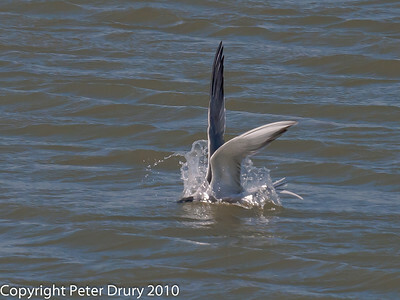 One bird arrives with a fish and another displays with wings slightly moved away from the body and head bowed. 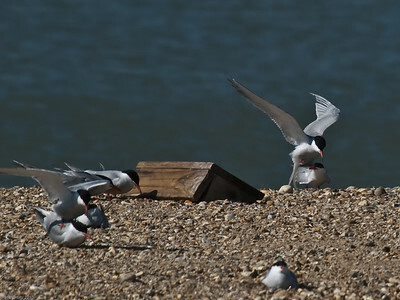 The birds mate and prepare for egg-laying. 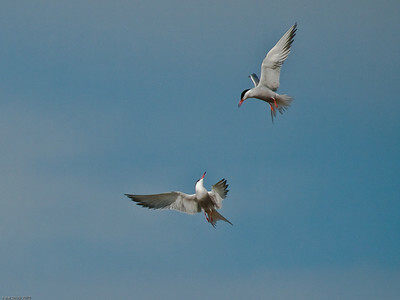 Every now and then, disputes arise over fishing rights. 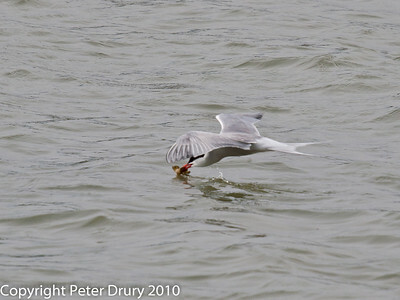 One of the Tern had regularly fished for crab on the eastern shore of the lagoon. 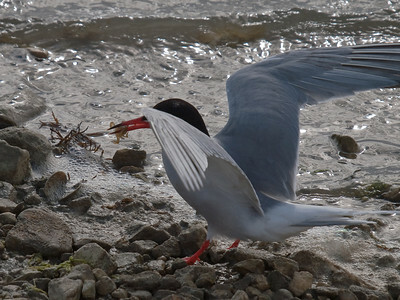 Another arrived to look for crab in the same area. 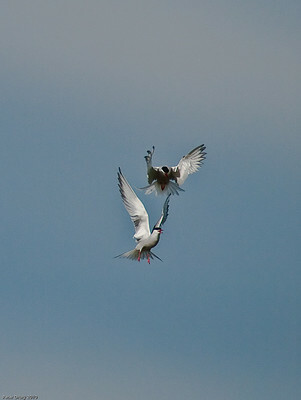 The resulting combat is pictured in the next few frames. 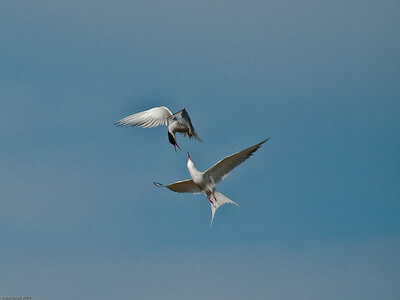 The combat lasted about 3 minutes and finally the birds pealed off and landed. 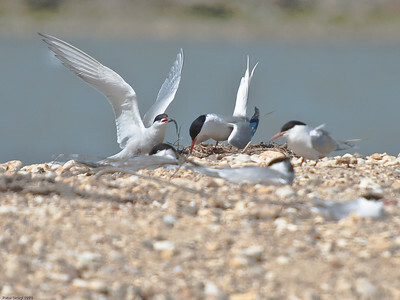 Each bird claimed half the shoreline and fishing resumed without any further dispute. 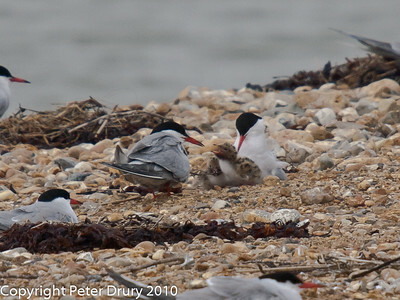 The Common Tern chicks started to hatch just before the appalling weather, 9th - 10th June. 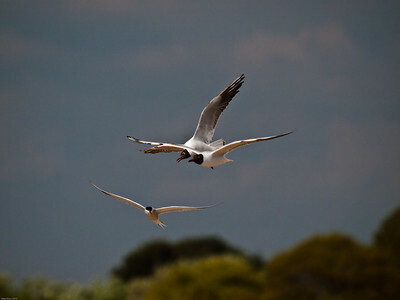 In some ways, they were luckier than the Black-headed Gull chicks in that the parents were able to brood them through the stormy times. 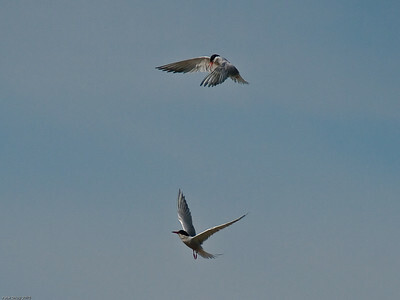 Under the wing of this Tern are its clutch of 3 chicks. Although the adult is clearly soaked by the rain, its chicks are warm and dry. Feeding continues, despite the weather. The chicks have left the comfort of the wing to feed. 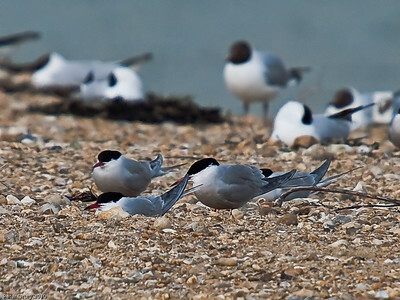 Note that the chest plumage of the chicks are white. 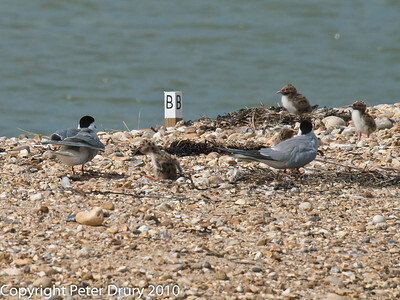 This is the easy way of identifying them from the Gull chicks. 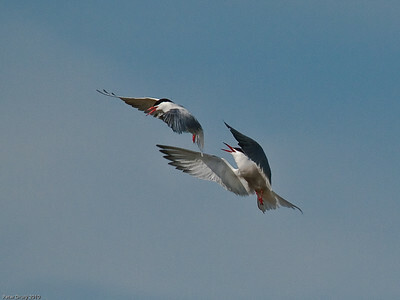 The Tern fearlessly defend their territory.The comparitive size difference between the Gull and Tern can be seen here. The chicks are now 5 days old. 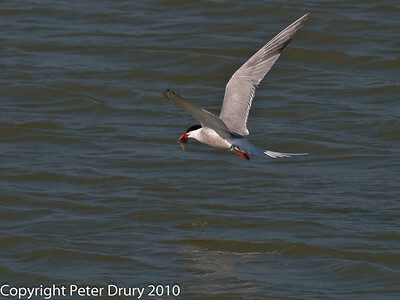 Fishing continues at an increased pace as more and more chicks appear. 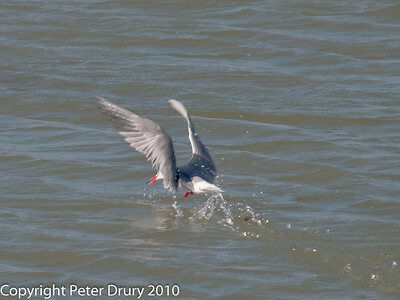 This Common Tern has caught a small brown flat fish for its chicks. 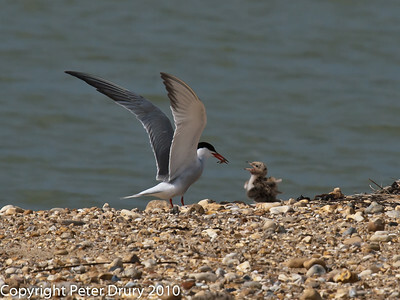 Unlike the gulls, the Tern feed their young with whole food. 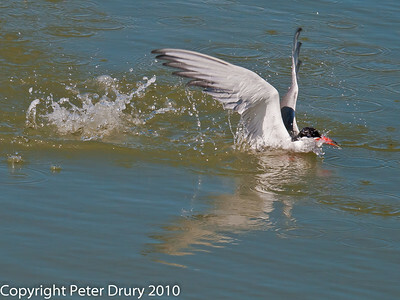 When crabs are caught, they are skimmed through the water to remove the legs and make it posible for the chicks to eat. 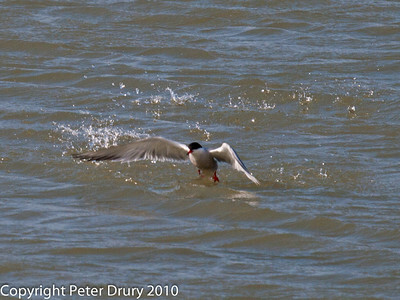 Water also lubricates larger fish and the Tern will carry out this process on them too for the same reason. 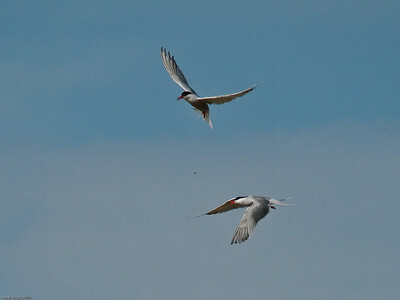 Every time an adult flies over the colony, all the chicks will call in the hope the tasty morsel is for them. The chicks are now 9 days old and have grown rapidly on the food supplied by the parents. Now at 19 days old, the chicks are almost as big as the parents. 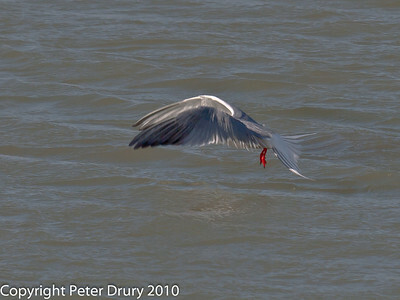 Their plumage is beginning to form on the wings. 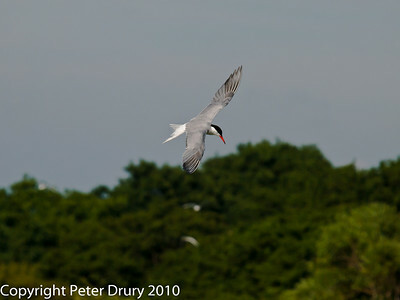 The images below demonstrate the flight agility of the Common Tern. 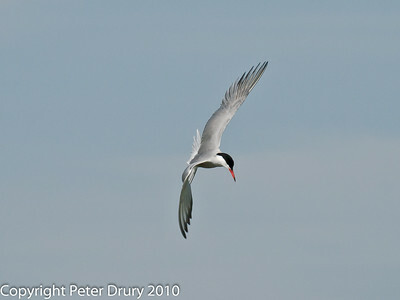 The speed combined with graceful movements has to be seen to be appreciated. 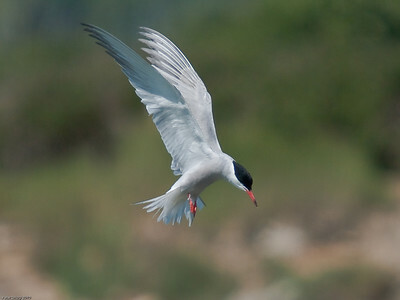 The chicks at 1 month old look very similar to the adults and already they have practised taking off and landing on the upper surface of the islands. This chick took off for the first time and crash landed near me. It was followed by several adult who were bombing me and calling out. 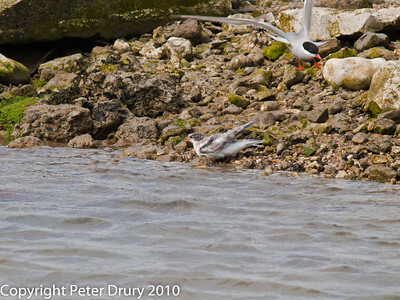 The chick took off again only to crash land on the island again. 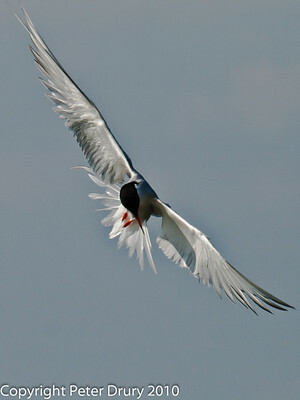 It climbed onto a rock and took off again. 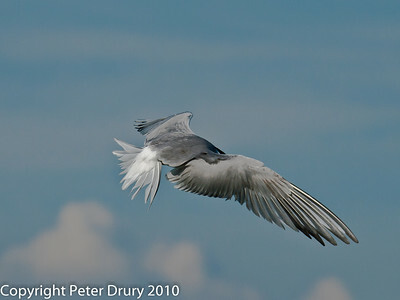 This time it was succesful in staying aloft. 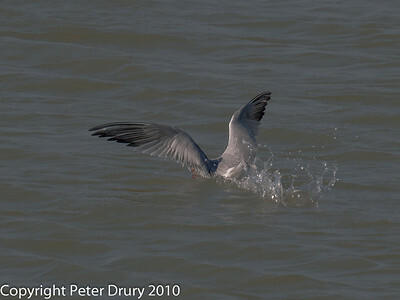 Looking at this chick, it seems to have tried to fly very early as its feathers are not fully formed.